Rostec is a Russian state owned company engaged in a wide range of businesses including engineering, manufacturing, and military aircraft and equipment. Its Russian Helicopters subsidiary supplied to the Burmese military and now helps maintain MI 24 helicopter gunships, MI 2 multi-role helicopters, and MI 17 helicopters which can be used for transport and as gunships. 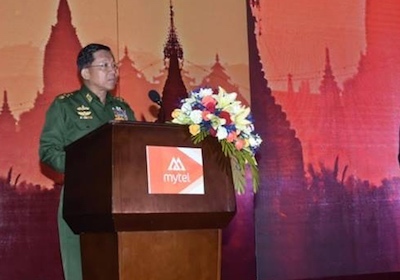 Its VO Tyazhpromexport subsidiary is in a joint venture with the military owned Myanmar Economic Corporation constructing and running an iron and steel plant, primarily producing pig iron. The plant is in Pang Pet, southern Shan State. Although currently suspended, there are plans to reopen the plant. Rostec also owns the famous Kalashnikov brand.